Photo Credit: Victor de Schwanberg/Science Photo Library. E-Cigarettes, or electronic cigarettes, have become increasingly popular. They are battery-operated devices that vaporize a liquid into a mist that is inhaled by the user, like a normal cigarette. The liquid is added to the e-cigarette via cartridges and contains nicotine, chemicals, and flavorings. Since the FDA does not regulate e-cigarettes, manufacturers may add chemicals to the cigarettes that may be toxic for human ingestion and that have not gone through the rigors of safety screening. Some chemicals found in e-cigarettes are known to cause cancer, according to an information handout available from the American Thoracic Society website. Many patients appropriately question whether these devices are safe, and many healthcare providers question whether they should recommend e-cigarettes for their patients. While some healthcare providers believe that e-cigarettes are ‘better’ alternatives than real cigarettes, others argue that there are other, safe, FDA-approved methods to help patients quit smoking. One of the leading sources of health information about smoking, COPD, and e-cigarettes, is the American Thoracic Society (ATS) which is the leading group of clinicians and researchers worldwide. Every May, ATS sponsors a large, internationally attended meeting where top experts gather to present new research findings and exchange information. The ATS is one of the premier sources of information that lung doctors access to learn about medical guidelines, research, educational materials for their patients. In an effort to help you get the real facts, straight from the researchers themselves, here are some very brief summaries of some of the clinical studies on e-cigarettes that were presented at the 2015 American Thoracic Society International Meeting in Denver, Colorado. Researchers in New Zealand (Bullen et. al) found that patients who used e-cigarettes and received phone counseling about smoking cessation did not have better ‘quit rates’ than those who used nicotine patches. This study did not have enough patients in it, however, to make firm conclusions. Researchers in Italy (Caponneto et. al) compared the amount of normal cigarettes smoked by patients who used e-cigarettes that had nicotine to patients who used e-cigarettes that had flavoring only. Patients used the e-cigarettes for 12 weeks. All patients had reduced use of normal cigarettes after the study, but only 10% of the patients quit. It is important to note that one of the researchers in this study was a consultant to the company that makes the e-cigarettes used in the study. A survey of middle and high school students in the United States found that e-cigarette use has doubled amongst teenagers and almost 10% of them had not been smokers before (Corey et al). It is not known if e-cigarettes are safe. E-cigarettes have toxic chemicals within them that cause lung damage in animals and human lung cells. E-cigarettes are NOT regulated by the FDA and therefore may have unknown substances within them that are harmful. E-cigarettes seem to help patients reduce the number of regular cigarettes that they smoke. There are several other proven effective ways to quit smoking that do not carry the unknown risks of e-cigarettes. Much more research is needed to determine if e-cigarettes are safe. This doctor’s opinion: until we know more, try other approaches to smoking cessation before using e-cigarettes. There is good evidence that e-cigarettes may cause lung damage. Although the idea of e-cigarettes seems like a good one, inhaling unknown chemicals and nicotine has serious health risks. If you are considering quitting smoking, the best approach is to work with your clinician and your family to try to quit smoking—don’t try to do it on your own. For other patient resources about COPD and other lung diseases and critical illness, visit the American Thoracic Society patient resources webpage. Bullen C, et. 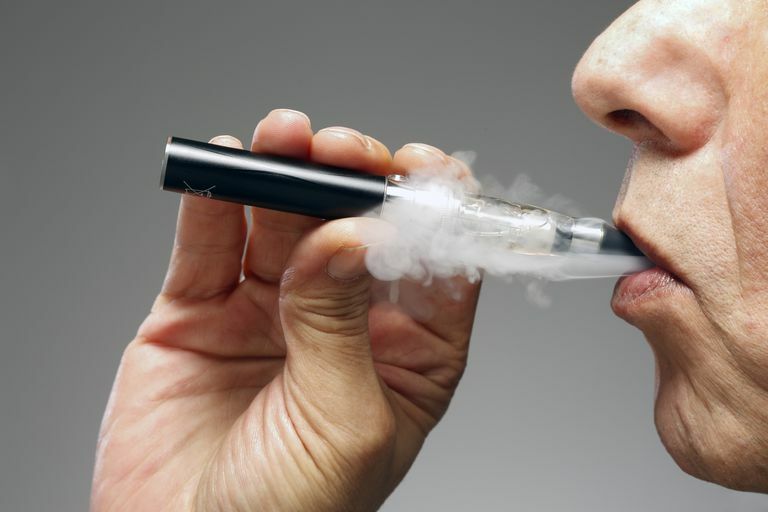 al Electronic Cigarettes for smoking cessation: a randomized controlled trial. Lancet 2013; 382 (9905):1629-1637. Caponneto P, et. al. Efficiency and safety of an electronic cigarette as tobacco cigarettes substitutes A prospective 12-month randomized control design study. PloS one 2013: 8(6): e66317. Corey C., et. al Electronic Cigarette Use among middle and high school students- United States, 2011-2012. MMWR: Morb Mortal Wkly Rep. 2013 Sept 6; 62 (35): 729-30.